The LG G3 Vigor AT&T user manual is available in english and spanish language. The manual provide detail reference information such as device layout with explanation menu and key functions, Optimizing Battery Life, Using a Screen Lock, Using Safe Mode, Installing the SIM card and battery, Inserting and formatting a microSD card, using home screen, Quick Switch to Silent/Vibrate Mode on page 20, Customizing the Apps screen, Using Clip Tray on page 29, etc. Then about using contacts, Joining and Separating Contacts, using social networking, using camera, Play a Video, using gallery and listen music, Launch Google Maps, using applications like Qslide, QuickMemo+, QuickRemote, smartshare, LG SmartWorld, and more. QuickRemote turns your phone into a Universal Remote for your home TV and cable box For tutorial read on paage 57. 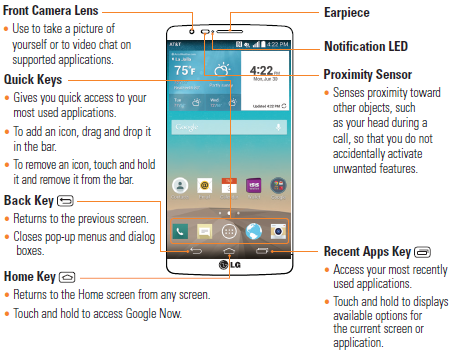 Other important information such as about settings guide like wi-fi and blueooth settings,Tethering & networks, Daydream, One-handed operation, security, Smart cleaning, backup and reset, printing guide, Phone Software Update, using LG PC suite on page 83, safety, Q & A, and more.